Is it possible to live in a Green House? Italian Architects Carlo Santambrogio and Ennio Arosio know it is. Think of the benefits. Your tomatoes would ripen quicker than your neighbours. Your heating bills would be a lot cheaper when the sun was out. The views would be 360 degrees, and you would never need to hang up a picture. On the other hand you would be a target for Peeping Toms and Big Brother fans. Santambrogiomilano is an Italian design company that specialise in exactly this way of living. With the desire for glass and unbroken vision and simplicity, these designers have produced some quite unbelievable architecture. 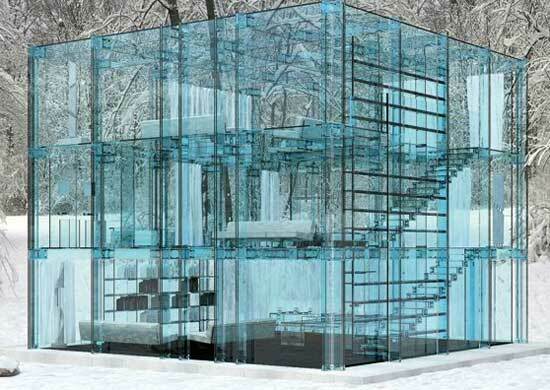 The unusual glass house concept from the designers, achieve their design intention using glass as the unquestioned protagonist. Nearly all the furniture is also made from glass. In fact it is the closes you will come to a Green House.